An aortic sinus is one of the anatomic dilations of the ascending aorta, which occurs just above the aortic valve. 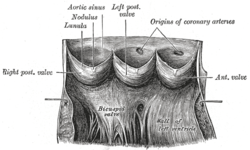 These widenings are between the wall of the aorta and each of the three cusps of the aortic valve. The left posterior aortic sinus gives rise to the left coronary artery. The anterior aortic sinus gives rise to the right coronary artery. Usually, no vessels arise from the right posterior aortic sinus, which is therefore known as the non-coronary sinus. Each aortic sinus can also be referred to as the sinus of Valsalva, the sinus of Morgagni, the sinus of Mehta, the sinus of Otto, or Petit's sinus. ^ Dorland's (2012). Dorland's Illustrated Medical Dictionary (32nd ed.). Elsevier. p. 1719. ISBN 978-1-4160-6257-8. Anatomy photo:20:29-0108 at the SUNY Downstate Medical Center - "Heart: The Aortic Valve and Aortic Sinuses"